Dr. Niccole was born and raised in Buffalo, NY. She was a three sport athlete in high school and played volleyball, basketball, and softball. When she was about 16 years old, she developed a shoulder injury from over-use, which led to neck and upper back complaints as well. She treated with many different specialists with no improvements, until she was treated by a chiropractor who was able to resolve all of her complaints. This is when she knew she wanted to become a chiropractor and to help other people. Furthermore, she knew she wanted to be able to treat the entire musculoskeletal system, including but not limited to the spine, shoulders, feet, joints, muscles, sports injuries, and so on. From high school, she went to D’Youville College in Buffalo NY for her Chiropractic schooling. Throughout her education, she learned how chiropractic and additional soft tissue techniques could further help to treat sports injuries and the musculoskeletal system, in addition to treating migraines. Dr. Niccole had suffered from severe migraines her entire life, so she was very inspired by this. She became certified in many different techniques including the Graston Technique and others. Through her own treatment with these valuable techniques, her migraines have resolved. 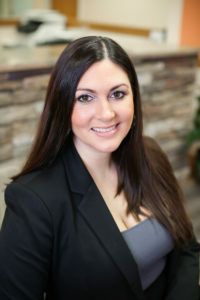 She has since continued to experience great pleasure in helping many patients resolve their migraines, spinal complaints, sports injuries, strained and torn muscles, and many other complaints. Her passion comes from the desire to help people, and her ability to see the incredible benefits of chiropractic treatment first hand. She and Doctor Patrick Alf had worked together in the past, and knew that they shared a similar philosophy in how to treat patients as well as in their passionate beliefs in Chiropractic treatment. 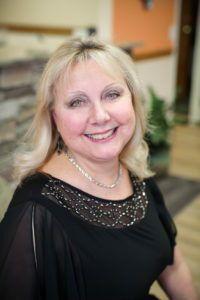 In 2013, she opened her business Complete Care Chiropractic and has been working here with Dr. Patrick Alf ever since. As her practice continues to grow, her favorite part about her job is being able to help people and make a difference in their lives. Her passion for helping people is evident every day as she continues to be able to live her dream. Dr. Patrick Alf was born and raised in Western New York. He attended Canisius High School prior to Keuka College in the Finger Lakes. He then continued on to New York Chiropractic College for his Doctoral degree. After concluding internship rotations at the Salvation Army in Buffalo and Tonawanda, as well as the Buffalo VA Medical Center, he earned a competitive internship position at the VA Medical Center in Miami, FL. At the conclusion of his time in Miami, Dr. Alf returned to Buffalo and began working in private practice. It was in this first practice where he worked with Dr. Niccole Jefferlone prior to the opening of Complete Care Chiropractic in 2013. Dr. Alf focuses on the combination of bone/joint and muscle/soft-tissue treatment to best improve his patient’s function and return them to their desired activities without pain. It continues to be his great honor to serve his patients and provide the best possible care to each individual. In his free time, Dr. Alf likes to water-ski during the warmer months and snow-ski in the winter. He is a big Sabres and Buffalo Beauts fan. William T. Hecht, B.S., D.C.
Dr. Will was born and raised in Rochester, NY. He was a three-sport athlete in high school, playing volleyball, baseball, and swimming. 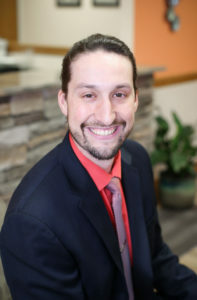 He graduated from Gannon University in Erie, PA in 2010 with a bachelor’s degree in Biology and began his doctoral education in the fall of that same year at New York Chiropractic College. It was at that time that he began to truly understand the importance of Chiropractic care and the positive impact that it can have on every aspect of life. Upon graduation from NYCC in 2013 he had the privilege of practicing in Woodbridge, VA; just south of Washington, DC. At Virginia Family Chiropractic, he was given the opportunity to work alongside and learn from some of the best Chiropractors in the area. Dr. Will was able to treat and manage an invaluable array of patient cases and presentations, developing a detail oriented style of care that focuses on soft tissue manipulation, stretching, and strengthening in conjunction with adjusting. In 2016, Dr. Will returned home to WNY to be closer to his family and friends. He continued to practice Chiropractic, helping others in the community that he loves the most. In March 2018, he joined the team of Dr. Pat and Dr. Niccole. He is thrilled to be a part of such a great group of Chiropractors that all share the same ideals, values and approaches to how important it is to genuinely care for people and make a difference in their lives. Dr. Will is driven by his passion to help others and incorporates this into his care by truly getting to know every one of his patients, their condition, and lifestyle; tailoring each treatment plan to fit their individual needs. He is sincerely grateful to be able to do what he loves every day, helping others. In his free time, you might find Dr. Will strumming his guitar, hiking, or cheering on the Bills and Sabres. 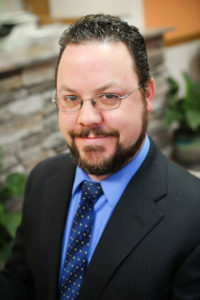 Jamey Kern was born and raised in Western New York. He went to Sweet Home High School and graduated in 1999. He fell in love with food and cooking at an early age and pursued a career in the culinary arts, working in various kitchens across Western New York. In 2015 he took a position in management at Wegmans where he developed his abilities to run a department. 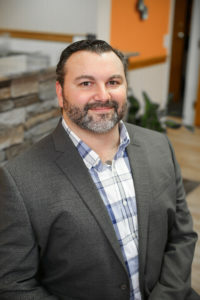 After 2 years with Wegmans, he and his wife, Dr. Niccole Jefferlone decided that his talents would be better used building the family business. In 2017 he took a position as the business manager of Complete Care Chiropractic. He continues to help build the business and loves being a part of the wellness community. His efforts recently assisted in a smooth transition from the Business’s old location to the recently acquired new location at 6470 Main St. Ste. 2 Williamsville,NY 14221. When Jamey isn’t working he is probably with his son Eddie, playing piano or guitar and trying to build his love for music as Jamey himself is a singer/ songwriter who spent many years pursuing his talents in a successful Buffalo band. He also loves being outside and finds nature to be a great stress reliever. He loves gardening and growing his own food and continues to cook everyday for himself and his family. When the weather permits he loves a good round of golf with his friends. Mary was born and raised in Western New York. Her parents were blessed by 9 girls total. Growing up in a busy household, Mary set her sights on work. After she graduated from Bishop Newman High School she started her career in the insurance industry as an adjuster. She crafted her skills and became an expert in her field. She learned how to work with all sorts of people and navigate difficult situations as well as develop her impeccable organizational skills. She continued to rely on those valuable years and the skills she developed and after 20 years decided to step away and focus on raising her two children. Years later she decided to re-enter the workforce and took a position as a school bus driver. She describes that as interesting and rewarding. She soon took a position as a No-Fault insurance adjuster and quickly recalled the skills she had built for so many years. During this time she was able to dissect and understand how medical billing relates to insurance and the sometimes complicated situations that can come from the two. She loved finding solutions to problems for people in need and valued the satisfaction from seeing those solutions really affect their lives in a positive way. She is a dedicated grandmother and spends a lot of time with her grandson. She recently decided to volunteer at her grandson’s school and loves being a positive influence on young lives in her community. Mary is an amazing person and displays characteristics that would make any business proud. Danielle was born and raised near Binghamton, New York. Throughout her adolescence she was always playing sports and engaging in physical activities. Living an active lifestyle and maintaining her health has always been important to her as an individual. Danielle’s family continues to be a significant influence in the course of her life, particularly her older brother. Enlisting in the United States Marine Corps, her brother has honorably served in Afghanistan. His bravery and dedication to his country has significantly impacted the aspirations of Danielle to work toward a career in the healthcare field. She decided to attend SUNY Oneonta where she obtained her BS in Biology and Chemistry. Opportunities brought her to Buffalo, New York after graduation and she joined our office, Complete Care Chiropractic, shortly thereafter. Her aspirations and persistent drive led her to further her education in the Health Services Administration Masters Program at D’Youville College. 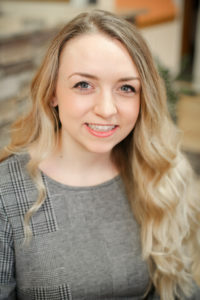 When she is not dedicating her time to the office or her studies, Danielle continues to maintain an active lifestyle of hiking, kayaking, golfing, and ice skating. Converted to a true Buffalonian, she attends Sabres and Bills games as often as opportunity allows.She is grateful for the opportunities and experiences Complete Care Chiropractic, and particularly Dr. Niccole Jefferlone have led her to. Cieran was born and raised in Williamsville, NY and attended Williamsville South high school and graduated class of 2014. She attended Daemen College and Buffalo State College where she studied music education. Her hobbies include singing, playing instruments, practicing yoga, traveling, and baking. As the second oldest of four children, Cieran enjoys spending time with her siblings and is the proud owner of three cats. As a former barista and connoisseur of coffee, Cieran is always seeking new places to experience a good cup. 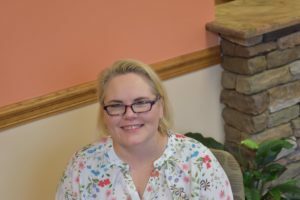 She has been working at Complete Care Chiropractic since early 2018 and has enjoyed her time there. She loves interacting with patients, getting to know the doctors, and learning new things about chiropractic care. Cieran is looking forward to spending more time in the office, getting to know patients, and continuing to expand her knowledge in health and wellness. Angie was valedictorian of her high school class and a proud member of the award-winning dance team and student council. She then earned a bachelor’s degree in Criminal Justice with a minor in Sociology. After college graduation, she married and moved to a small town in Texas. She soon became a stay-at-home mom until her small family moved to Buffalo. A job transfer brought them here in 2008. Having lived in many different states over the years, Angie was accustomed to adapting to different regions and cultures. However, WNY was a new experience for her. The “city of good neighbors” felt like a good fit, and she quickly settled into her new home. Over the years, her son has grown and thrived here. He is now in his second year of studying Physics at The University at Buffalo. Angie has diverse job history. She has dedicated herself to being an elementary school tutor, a daycare director, a small business owner, and a board member of a library and museum. Most recently she has been developing her skills as a retail manager. Although new and challenging, Angie is excited to delve into the world of healthcare. 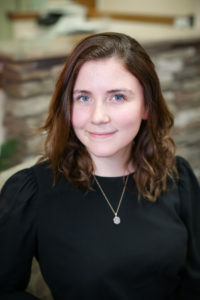 She says that she wants to continue growing and feels that being in an uplifting and positive environment here at Complete Care Chiropractic is an amazing opportunity and she is excited to continue the next chapter of her professional life with them. Although dedicated to her growing career and her family at home, Angie does have a passion for photography. She specifically loves taking pictures of animals, nature, sunsets, and architecture. She also loves antiquing with her son, reading, watching movies, and exploring what WNY has to offer in her Jeep. Angie is committed to developing lasting, meaningful relationships and having a positive impact on others. She likes that being at Complete Care Chiropractic gives her an opportunity to do just that on a daily basis. She feels that working with people who are genuine in their desire to help others in need and to make a positive impact in our community is very rewarding and a driving force in her desire to help others.